Talei Morrison comes from a family of entertainers. Growing up with poi as a normal part of everyday life has seen her affinity for this taonga develop through to the highest competitive level with champion group ‘Te Mātārae I ō Rehu’. 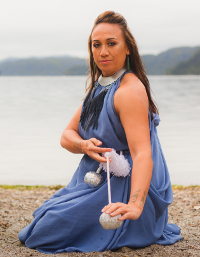 Between the distinct, athletic style of Mātārae and the original influence of the infamous Te Arawa poi ‘Pākete Whero’, Talei’s style reflects an evolutionary mix of old and new. Her commitment to education and sharing knowledge for future generations is seen in her mahi as a Learning Facilitator at Te Tai Wānanga.